I created a new Pinterest board today entitled “Let’s Freak Out About Babies” and it pretty much sums up my state of mind lately. I’m swiftly approaching my third trimester and I have bought approximately none of the things I will be needing. I have goals to paint large swaths of my house and decorate and Kon Mari all my possessions before she arrives, but WE SHALL SEE. Anyway, I am feeling like I really want someone to brush my hair and speak to me in hushed, reassuring tones while I make practical lists and eat large bowls of comfort food. 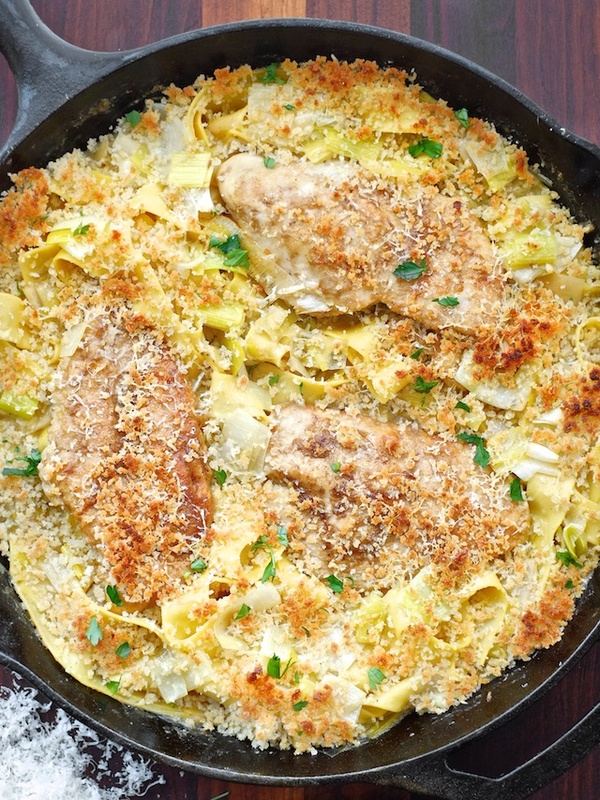 And this is what I mean by comfort food – softly cooked leeks with creamy pasta, tender chicken, a generous handful of parmesan, and some crunch to keep it interesting. It’s also relatively simple to put together and makes really good leftovers the next day. The chicken in this recipe is braised, which means it’s slowly cooked partially submerged in flavorful liquid (chicken broth in this case). I like braising for this dish because it produces chicken that’s gently past done, bordering on shred-able, in a really good way. You could also certainly use boneless, skinless thighs or even bone-in, skin-on chicken thighs or breasts in place of the boneless, skinless breasts I use here (most of my family are bone haters, so I do boneless most often). I’d omit the flour dredge if you use skin-on chicken and focus on browning the skin side before braising. 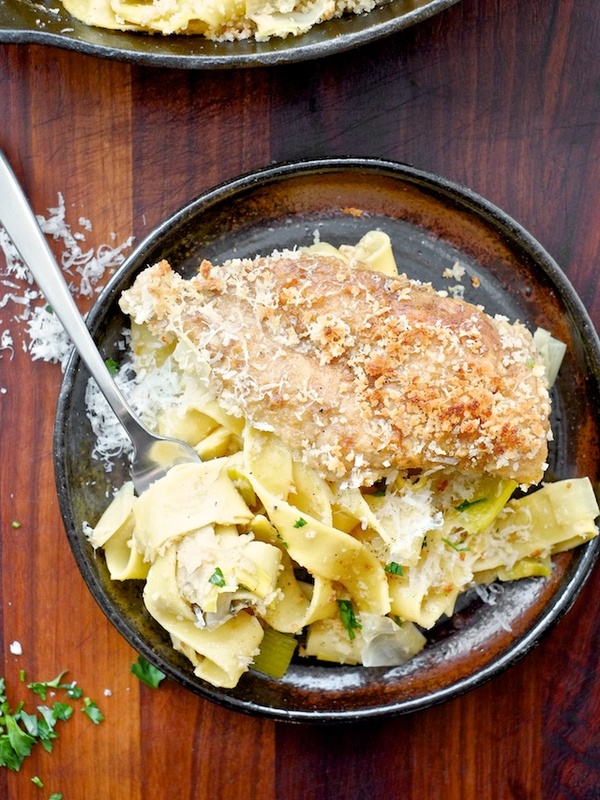 They should cook in about the same amount of time, but test a piece with a fork before you add pasta and panko. 1. In a wide bowl or pie plate, combine flour, salt, pepper, and cayenne. Mix well and dredge chicken pieces one by one, making sure they are evenly coated in flour. 2. In a large oven-safe skillet (meaning it doesn’t have any plastic bits or meltable handles), melt butter over medium heat and brown the chicken on both sides. When the chicken is browned but not necessarily cooked through, remove it to a plate and set it aside. 3. In the same pan with the butter and leftover chicken drippings, sauté garlic quickly (until fragrant) and deglaze the pan by pouring in the 1/2 cup of wine. Allow the wine to reduce by half it’s volume. 4. Add the chicken broth to the skillet along with the chopped and washed leeks, and nestle the chicken back into the pan. Reduce the heat to low and allow the chicken to simmer 30-40 minutes or until cooked through and tenderized. 5. Remove the chicken to a fresh plate and (if necessary) turn the heat up to medium/medium-high and allow the broth with the leeks to reduce until it holds a line for a split second when you swipe a spoon across the bottom of the pan (the thickness of the sauce is somewhat a matter of personal preference, so don’t worry too much about it). When the broth is reduced to your liking, turn off the heat, add the cream and 2/3 of the parmesan, taste it and add salt and pepper if necessary. 6. In a separate pot, boil pappardelle according to package directions. Don’t forget to salt the water. While the pasta boils, preheat your broiler on high. 7. In a small microwave safe bowl, melt reserved Tbsp of butter. Add panko breadcrumbs and reserved 1/3 cup of parmesan and mix well. 8. When the pasta is al dente, add it to the pan with the leeks and sauce. Toss the pasta to coat it well in the sauce, and taste. Add salt, pepper, a splash of cream, more cheese, or a squeeze of lemon to finish the pasta as you like. 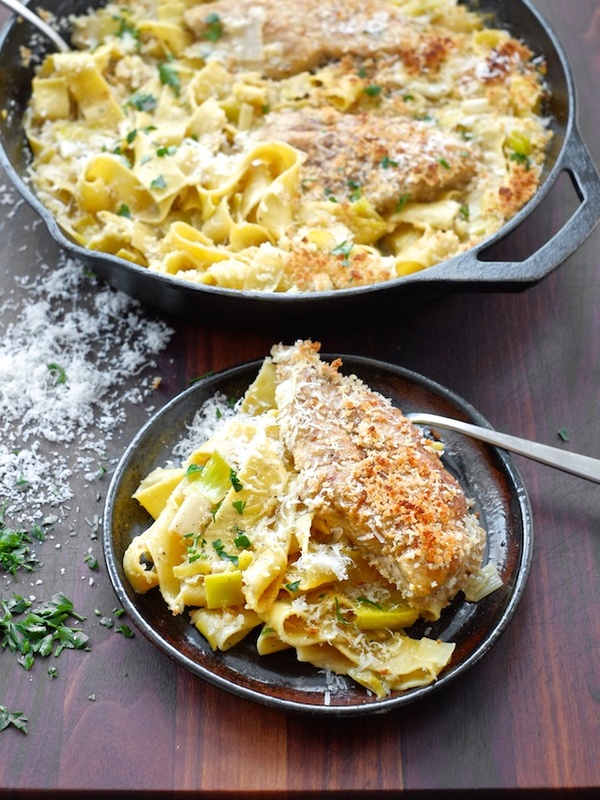 Nestle the chicken back into the pan with the pasta and leeks, top with the breadcrumb/parmesan topping, and broil it until the top is nicely browned. Garnish with parsley if you like.